Looking for Drilling Rig Logistics Partner? From Port to Site. McLeod has the team and experience to support, plan and transport your Drilling Rig. 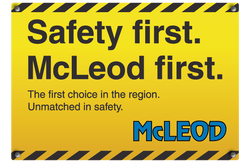 McLeod has the experience to ensure your project remains on track. We understand the industry and the commitment to support a working Rig 24 hours a day 7 days a week rain or shine. From engineered lifts at short notice to planned or unplanned Rig Skids or Moves our team have been there and know the routine to create a safe evolution.